More than a decade ago, village Chhoti-Kasravad's Moolchand was held eligible for compensation by the Grievances Redressal Authority (GRA) of Madhya Pradesh against the displacement he suffered because of of the land acquired for rehabilitating Gujarat's Sardar Sarovar dam-affected families in Gujarat. The Narmada Valley Development Authority (NVDA) filed a petition in the High Court against the GRA order. The NVDA argued that changes in the fundamental rehabilitation policy were such that he was not liable to the benefits. After hearing advocate Pratyush Mishra, who appeared on behalf of the displaced person, and advocate Vivek Patwa, who argued for NVDA, the High Court dismissed the NVDA petition and ordered early this month for the reinstatement of Moolchand's eligibility for two hectares (ha) of land. He was called a 'rehabilitation site displaced'. The GRA's order was declared acceptable and justifiable. 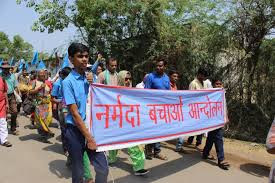 Commenting on the order, Narmada Bachao Andolan (NBA), which has for long taken up the cause of those displaced by the dam as also other sections, has said, this order makes it possible for a large number landless, all of them devastated farmers, Dalits and adivasis, to finally get their "just compensation." Thousands of hectares of lands were acquired for the rehabilitation sites in Madhya Pradesh for the dam-affected people from the farmers in the submergence area. The GRA argued that most of this land was acquired before 2003 forcibly for building rehabilitation sites. Those who were displaced this way should to get benefits equal to the submergence affected people, it insisted. According to NBA, the GRA order order is based on the inter-state Narmada Water Dispute Tribunal (NWDT) as also rehabilitation policies of different states for the Narmada project. Various orders of the Supreme Court orders since 2000 too upheld the need to provide such compensation. "The definition of displaced from 1989 to 2003 took into account payment of compensation to the submergence affected people to any type of displacement resulting from the Sardar Sarovar project as also other projects on Narmarda river. They were all given equal compensation", says NBA. "In 2001, by amending this definition, only those families affected by canals or for Sardar Sarovar colony sites were included for compensation, apart from submergence affected, as eligible for benefits. And In 2003 another amendment was introduced, making the definition even narrower and including only submergence affected as eligible", NBA asserts in a statement. Interestingly, however, according to the Rehabilitation Policy (clause 4.3), which came into effect in 2003, the lands of any Dalit and adivasi, as also any small and marginal farmer, should not be acquired. It was also mentioned that any land acquired from any other farmer would be limited to at least two hectares being left for their use. According to the NBA, "NVDA sidelined all these legal foundations and went ahead with acquiring land forcibly and illegally from Dalit, adivasi and other farmers, due to which many were rendered landless and many were left at the margins", says NBA. "This led to beginning of their struggle of their justice." It continues, "GRA passed many orders in favour of these displaced sections, but the NVDA did not follow most orders and refused land to many families, one of whom was that of Moolchand. After the NVDA filed a petition against the GRA order in the Madhya Pradesh High Court, Indore bench, the case was argued for a whole month, and the result was the positive order." "The order, issued by a bench comprising of Justice PK Jaiswal and Justice Virendra Singh, makes it possible for farmers to get back fertile lands. It is NVDA's duty to not waste public money on appeals and petitions, rather focus on justifiable rehabilitation of all displaced", NBA insists.